From a family collection. Click to enlarge. 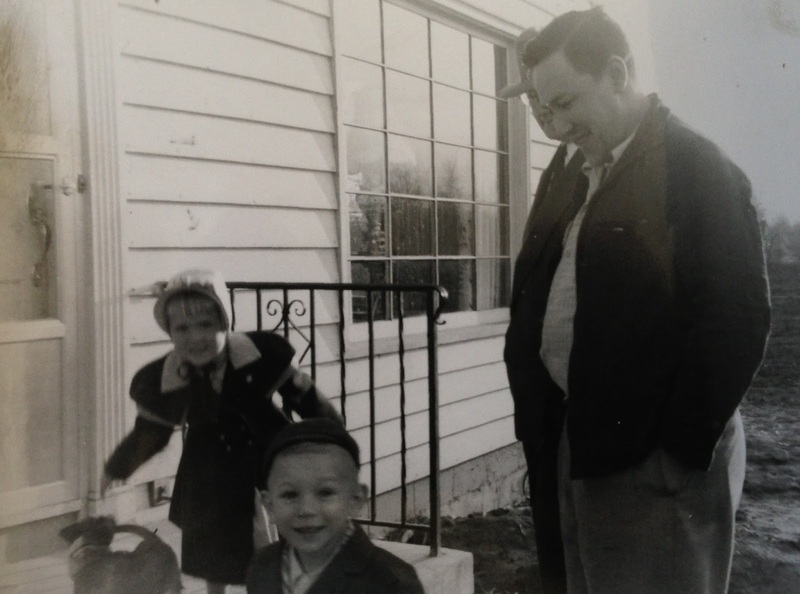 Standing in front of his newly built house on 607 Mansell Drive are my grandfather Chuck Lowry (left) and godfather/uncle Chuck Lowry (center, about age 3). Based on my uncle’s apparent age and other photos in the series, I imagine this photo dates to around spring of 1952. You’ll notice there is no grass in the yard. As the house was finished in the autumn of 1951, they probably waited until 1952 to plant grass. I’m not sure who the other two people are in the photo, including the adult behind grandpa and the young girl. Perhaps a cousin? Does anyone know the name of the dog? The dog's name is Suzie. She was my Christmas present in 1952, shortly after my third birthday. We only had her a few months, and then she disappeared. I was only told that she ran away, though whether that was true or not I could not begin to say. It could have been anything. Based on what the young girl and I are wearing, it was still cold weather, so the timing works. I think, though, that this is more likely to be late winter/early spring of 1953 than 1952, after my third birthday, not my second. I am now 63 years old, so the girl in the picture would have to be 64 or 65 now. I'm not sure who qualifies. I am pretty sure that the adult behind dad is not Daddy Groc. I blew up the picture and the face is wrong for Daddy Groc. I do not recognize the person. It could be anyone at all, from the post office or from church or from Western & Southern or anyone. No idea who it might be, though the natural assumption is that the young girl is his daughter. What they are wearing indicates that it might be a Sunday. Dad tried to go to Mass early and always changed clothes right away, as soon as he got home. The ethnic parishes usually had Masses later than the geographic parishes, so that may be a hint. I wish I could be more help.